Over the past 10 years, I’ve avoided specifically talking about gluten in a public forum. I’ve had my opinions on it, and those opinions have vacillated over the years, but I could never put my finger on whether or not people should avoid gluten. You see, I’ve read the research that 6 out of 7 people develop increased inflammation to gluten, that gluten isn’t the only problematic protein in wheat, that humans aren’t “adapted” to eat gluten, yet at the end of the day, there were way too many healthy, lean individuals eating gluten, every day without any complications. On one hand, how could so many people see benefits from going gluten-free, while on the other so many people eat gluten regularly without any problems? This perplexed me endlessly and the more research I did, the more I wasn’t sure what the answer was. For something mankind has been eating regularly for centuries, I just couldn’t see how a little more gluten in the current strain of wheat was causing so many issues for so many people. These “issues” are not small ones either, but instead a slew of over 250 symptoms from an increased incidence of cancer and heart disease (the top two killers of Americans) along with many smaller and benign symptoms such as depression, GI distress and fatigue, amongst hundreds of others. How could all of these symptoms come from a small amount of protein that is not digested by some people found in wheat products? The search for this answer really started in 2005 when I first experimented with a gluten-free diet and got relief from symptoms that had been plaguing me for the previous two years. For nearly two years, before going gluten free, I had felt awful, fatigued all the time while suffering from consistent canker sores. For me, the question was, “How could I have gone from a diet full of pizza, beer and sandwiches in college, to not being able to have a little wheat in soy sauce so quickly?” It was something that perplexed me for years. There were three things that I knew when I was trying to figure out what had happened to me. The first was that I had taken antibiotics for my acne in college. Not only had I taken antibiotics, but I did so for a good year long plus, while drinking heavily for a good portion of the time I was taking them. When I first found out about gluten, I was really hoping that it was just a candida overgrowth (and truthfully, that’s still completely out of the realm of possibility, but highly unlikely). Candida is a fungus that is not supposed to show up in the bloodstream and some doctors are not sure that it happens, but like most bacteria and fungi, they have a way of adapting and changing to survive in places that they are not supposed to be. The third is that most of my symptoms were caused by vitamin and mineral deficiencies, which meant that my issues started with my stomach despite never having any pain there. Over the past decade, I have read more theories, hard (and boring) research on celiac disease and books than most people should on the topic. Only in the past year, has more and more research started to answer how I developed a gluten sensitivity. For those of you that don’t know, the difference between celiac disease and gluten-intolerance is that with celiac disease there are permanent damages to the lining of the intestine, while gluten-intolerance causes similar complications, but there is no permanent damage. In all of that time, there has not been an opinion whose sentiments best matched mine. That is until earlier this year when a doctor, Martin J. Blaser published his book, Missing Microbes. To date, I think this is the best book on the subject of why there has been an increase in auto-immune diseases over the past 20 years, with everything from peanut allergies to autism to the increase in celiac disease. In addition to these conditions, anyone with Hashimoto’s disease (a type of hypothyroidism) or those who have unexplained rapid weight gain might be at risk of having a gluten intolerance. Instead of trying to sum up his writing, the rest of this article is from his book, Missing Microbes, pages 172-176. If you have any questions after reading through everything, please feel free to let me know and/or purchase the book. Any emphasis added below is mine, not in the book. “My daughter Genia was born in 1983, and like many kids she had a lot of ear infections…so until she was six or seven Genia received many courses of antibiotics for days or weeks on end. It was mostly amoxicillin, the pink liquid with the ultrasweet odor and taste. Her story is not unique. Since her teenage years, she has been going to Latin America, working, studying, helping disadvantaged people, and traveling and exploring along the way. Not surprisingly, based on how she traveled, where she stayed, and what she ate and drank, she had multiple episodes of diarrhea…a few times she had a particularly uncomfortable intestinal infection caused by a protozoan called Giardia. Such infections are commonly treated with the antibiotic metronidazole (also sold as Flagyl). Metronidazole, which is often used to treat intestinal infections, not only targets Giardia but also has major, broad effects on the resident bacteria of the gut. Genia took four courses of metronidazole in 2008 and 2009, but her abdominal pain only became more frequent. After working in Ecuador in 2009 and taking another course of metronidazole, Genia developed severe abdominal pain and continuing diarrhea. Her symptoms persisted for months. Blood tests indicated that she was anemic and that her body wasn’t absorbing certain vitamins very well. By then, she had returned to Boston to study law. One night, Genia’s symptoms were so bad that she went to the emergency room…I was distraught about her condition…I enlisted several truly outstanding doctors to evaluate her, but neither they nor I could find the cause of her troubles. She took blood tests for celiac disease, an intestinal malady that produces similar symptoms, but the assays were normal. With celiac disease…people are allergic to the main protein in wheat (which also is present in barley and rye), called gluten. Even eating a tiny amount of gluten can trigger an immune reaction that attacks healthy cells lining the small intestine. In other words, the immune system treats gluten as a deadly invader, not as food. Symptoms include abdominal pain, diarrhea, bloating, and fatigue. Even if a person manages to avoid gluten for months, the symptoms can come back immediately on reexposure. The incidence of celiac disease has skyrocketed in recent decades, more than quadrupling since 1950. In 2009, Genia underwent endoscopy of her upper intestine, including a couple of biopsies to look for celiac disease, but again the tests came back normal. Meanwhile, her symptoms continued, lasting for more than a year. She was miserable. Rardi suggested that Genia start a gluten-free diet, to see if it helped. She did, and almost immediately her symptoms went away. For the first time in months, she didn’t have abdominal pain. 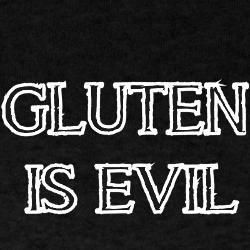 Unfortunately, people with celiac disease face a serious problem: gluten is everywhere. One night, the sharp pain came back. She realized that she had eaten soy sauce at a restaurant, which is when she discovered that soy sauce often contains gluten. After that she avoided gluten and felt great for a month. Then one day as she was traveling…and stopped for fast food, she ordered French fries. Again, within an hour, abdominal pain struck her as severely as it had when they though her appendix might burst. Later she learned that those French fries contained gluten. Nowadays Genia is scrupulous about what she eats and has been almost entirely free of symptoms since the French fries episode. As a scientist, I can’t prove that Genia has celiac disease, but her symptoms are certainly consistent, and a more recent blood test showed for the first time that she has elevated levels of gluten antibodies. What piques my interest is all of those courses of amoxiciliin that we gave her as a child, and then the courses of metronidazole for her “Giardia” infections. It suggests to me that she had major early-life disruptions in her resident microbes that led to her asthma and mango allergies. Later on, metronidazole was the coup de grace, eliminating some population of microbes in her gut that instructed her immune cells to suppress certain allergies, including gluten. I was invited to join another analysis of celiac disease by the same group of experts…The question was: Is there any relationship between the presence of H. pylori in the stomach and celiac disease? We know that H. pylori is disappearing just as celiac disease is becoming more common. Could this suggest a protective relationship?…We also know that H. pylori helps suppress immune and allergic responses through its recruitment of T-reg cells, the cells that tone down and turn off immune reactions. So could the extinction of H. pylori be contributing to this modern plague as well? To find out, the Columbia group, working with a team of pathologists at a large national reference laboratory in Texas, investigated more than 136,000 people…Because the study was performed in the United State, the overall rate of H. pylori was very low. Nevertheless the rate in patients who had signs of celiac disease was only 4.4 percent as opposed to 8.8 percent in those without. It is plausible that celiac disease is increasing because the microbes that protect against allergic responses are disappearing. Both stomach bacteria (H. pylori) and intestinal bacteria (those susceptible to metronidazole and/or other antibiotics) may provide some protection against celiac disease. People who have H. pylori in their stomachs can still develop celiac disease; it just may be less likely. Moreover, people born by C-section also face an increased risk. With this knowledge, we might one day be able to find the individually protective organisms and either prevent their loss or give them back to prevent celiac disease or to treat it. In the end, this is the only explanation that answers the seemingly opposed question of, if gluten is so bad for so many people, why can so many people eat it without a problem? The answer is our bacteria. It may be true that most people don’t have the complete digestive enzymes to fully break down gluten, but it can also be true that with enough of the right bacteria, it doesn’t really matter. Just as humans can’t make vitamin K and don’t eat a lot of it, it doesn’t matter for most of us, because we’ve outsourced that responsibility to the bacteria in our guts. As such, we might have done the same thing with digesting gluten. Whereas Genia had immediate pain from eating gluten, most people don’t experience this and often times it isn’t until a day or two afterwards where most people will feel any symptoms after eating gluten. In that sense it is not like a typical allergy and therefore, if you are suffering from any chronic condition, from obesity, to rashes (80% of those with unexplained rashes have shown antibodies to gluten), Hasimoto’s disease, arthritis, anemia, Type I diabetes, amongst others, I would suggest at least explore doing a strict gluten-free diet for at least 4 weeks and see if you feel any better.